My name is Ilan Levy-Mayer and I am a Vice President and Senior Broker. I came up with the following personal observations after serving online commodities traders worldwide for more than 20 years. The following steps are guides to progress, and are not necessarily in sequential order. Some of them are always required, but each futures trader is different and will relate to these stages in their own ways. While attempting to learn and progress, one must keep in mind that futures trading is risky and can involve significant losses. 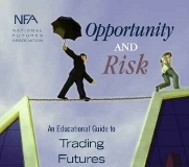 Hopefully if you are already trading you have completed your initial futures trading education: contract specs, trading hours, brokers, platforms, the opportunities as well as the risk and need to use risk capital in futures trading, and so on. 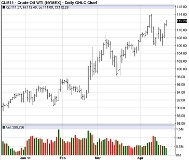 Understanding this information is essential to commodities trading. The second type of education is ongoing: learning about trading techniques, the evolution of markets, different trading tools, and more. I am definitely not advising you to go on the web and subscribe to a "black box" futures trading system (using buy/sell triggers if don't know why they are being generated). What I am advising is developing a trading technique: a general set of rules and a trading concept. As you progress, you may want to put the different rules and indicators into a computerized system, but the most important factor is to have a focus and a plan. Don’t just wake up in the morning and trade "blank." This is the key! Do what you need to do in order to survive this brutal business and give yourself the chance of being here down the road with more experience and a better chance of success. Survival is probably the biggest key for beginning commodities traders. There is a saying in this business: "live to trade another day." It is so true! While it is closely related to survival, money management in futures trading can also stand alone. For your own survival, you must set trade/daily/weekly loss limits. Sound money management is closely associated with knowing your risk-reward ratio (again, per trade and per time frame). You should have a game plan and established goals which will function as a road map	to measure your progress and improvement. Set per-trade goals, daily goals, weekly goals, etc. Many of you who are clients are familiar with these questions: What is your daily profit goal? Where do you see yourself in a week from now.? Six months from now? A year from now? How are you planning to get there? Break it down into small steps, and you’ll always know whether or not you’re on the right track. And do not forget to continually re-evaluate your financial situation as it pertains to risk capital. If you made it to this stage you're on the right track! Just like anything else in life, the more experience you have in commodities trading, the greater your success is likely to be. The key is to acquire the experience without devastating your risk capital. What good is experience without risk capital in your trading account? Teach yourself to recognize different set-ups that you feel comfortable and confident with. Then attack. You cannot get to this stage without going through the previous steps. If you did not survive, develop a trading system, set goals, etc., you may recognize the right setups but lack the confidence or the cash to take advantage. I sometimes compare being the futures trading “pro” to the lion who is waiting patiently for its prey and then attacks when the time is right! This means you will continue to evolve as a trader and go through these stages over the years again and again. Don't be discouraged by reading this. Succeeding in futures trading takes hard work and time. Please be realistic, make sure you only try this with risk capital only and periodically check yourself and try to learn from your mistakes and successes.